Wowee! What a whirlwind it has been lately. A few weeks ago, Jonah and I were in Chicago for the 4th of July holiday, and it seems like from there, things got crazy. The night we left for Chicago, we applied to rent a house, and the night we got back we found out we got it! We are now living in NE Portland, within walking distance to Porque No?, Tasty n’ Sons, and countless other places. Mississippi and Alberta neighborhoods are a stone’s throw away, and I’m discovering a part of the city of which I had only scratched the surface. It’s pretty sweet. Be on the lookout for reviews of some spots in our new hood. It has been a while since I gave you guys a recipe. This is one I made a while back, but it is just as perfect for right now. This past weekend, we went out to Sauvie Island to go berry picking – we have blueberries coming out of our ears! As well as raspberries, peaches, and a few ears of corn. 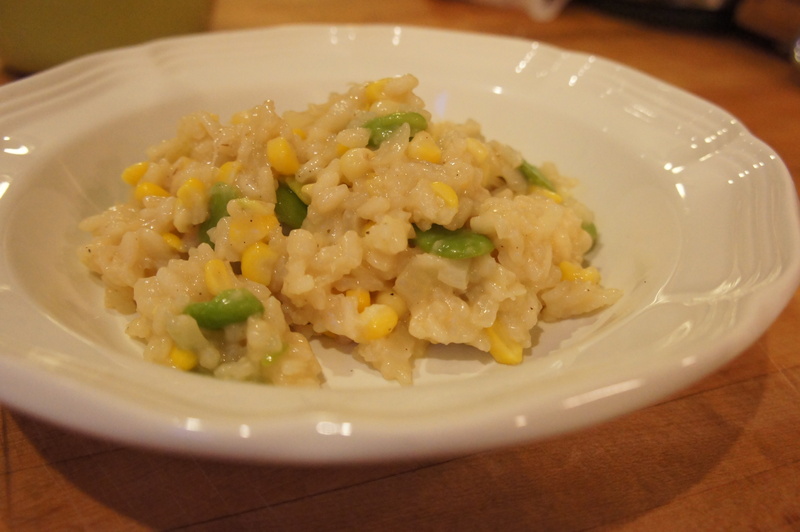 The corn reminded me that I STILL hadn’t posted this risotto recipe! I’ve discovered that risotto is such an easy meal to make and you can really throw in anything you have around. Saffron? Sure. Squash? Yup. Mushrooms? Why not. 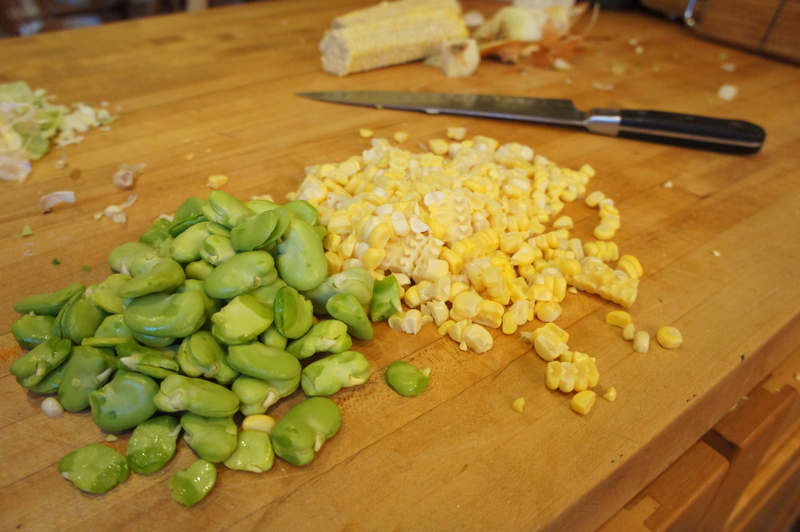 But this was a great spring & summer risotto with fava beans and fresh corn. In a saucepan over medium-high heat, bring the broth to a simmer. Reduce heat to medium-low. 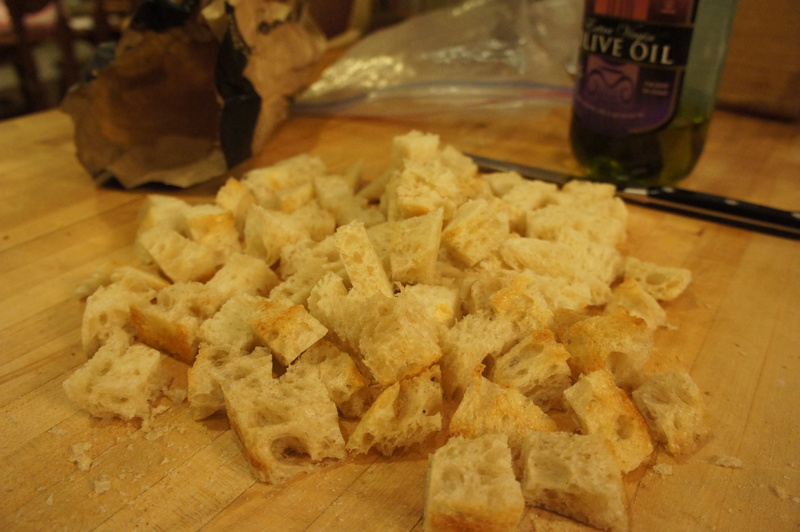 In a separate saucepan over medium-high heat, heat the olive oil, then add the onion, garlic, and salt. Cook them until the onions are soft but not browned, about three minutes. Add the arborio rice and stir to coat it in olive oil. Add the wine (or in my case, beer, because I’m classy like that) and cook until the liquid has been absorbed and evaporated, stirring constantly. Now add the broth, one cup at a time (or one ladle full at a time). Stir the rice frequently after each addition, and only add more broth when the previous broth has been absorbed. When you have added half the broth (after about 15 minutes), add the fava beans and corn. Continue adding broth and letting the rice cook and absorb, until the rice is tender but still has some bite to it. You may not need all of the broth. When the texture seems good to you, add about 1/4 cup of broth, remove the pot from the heat, and stir in the parmesan, and salt and pepper to taste. Enjoy! I mentioned a couple of weeks ago that Jonah and I recently purchased The Family Meal by Ferran Adria. As soon as we got it in the mail, Jonah proceeded to look at the whole book, page by page, cover to cover. Which was really adorable. He was pretty excited. Anyway, a couple days later, I finally got it out and flipped through it, and I too got really excited. There are so many awesome recipes in this book, and the layout is great. It tells you the timeline of your meal (2 hours before, you can start doing task #1, 1 hour before, you can start doing tasks #2 and 3, 40 minutes before… you get the idea), it tells you how much of each ingredient you will need to make the meal for 2 people, 6 people, 20 people, and 75 people. So we can perfectly cook for just the two of us, or we can cook for us and a bunch of friends. Lastly, the recipe itself is in photograph form, so you know exactly what each step looks like, which is such a big thing for a lot of people. And it has super specific instructions, i.e. instead of saying “cook until lightly browned” it says “cook for 16 minutes.” Which is so nice. Anyway, while flipping through it for the first time, we marked a bunch of the recipes we wanted to try first, and then went to the store to pick up ingredients for a couple meals this week. The coolest thing was that because we had bought a chicken at the farmers market a couple weeks ago, cut it into pieces, frozen the pieces, and made broth out of the carcass, we had almost all of the ingredients we needed for these meals. First up was saffron risotto with mushrooms. 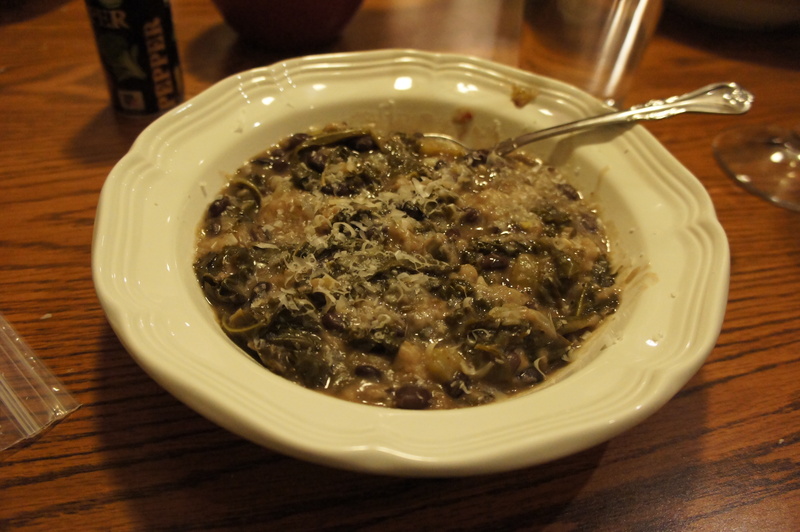 I have never made risotto before, and was a bit nervous about it, because it’s one of those things that seems like it might be easy to mess up – overcook, undercook, underseason, overseason… etc. But because the instructions for these recipes are so specific, I had no fear! Put all of the stock into a sauce pan, cover, and bring to a simmer. This is the weird part, where I wish you could see the cookbook so you could see the photos. Make a little envelope out of tinfoil, put the saffron threads in it, and toast them in a pan over medium heat for one minute. Don’t le it burn! Remove from the pan and let it cool. In a large pan or pot, heat the oil over medium heat, then add the onions. Once they’re soft, but not browned, add the wine and scrape up any browned bits from the bottom of the pan. When most of the wine has cooked off, add the rice and let it cook for 3 minutes, stirring all the while. Add one ladle-full of stock, and cook for 2-3 minutes, stirring often to keep it from sticking. Pour the rest of the stock into the pot. Quickly chop the saffron and add it to the pot. Cook the rice for 16 minutes (what precision! ), stirring frequently. While the rice is cooking away, wipe the mushrooms clean with a paper towel, and slice them as thin as you can. You can use a mandolin if you’ve got one, or just a sharp knife. Put them in a bowl and set aside. When the rice has absorbed the majority of the liquid and is a little al dente, add the butter, and then the parmesan. Stir until the rice is nice and creamy, and season it with salt, pepper, and lemon juice. Spoon the risotto onto plates and top with mushroom slices, and enjoy!